Back in March of this year, Tesla achieved the enviable feat of crossing over 2,000 superchargers for its worldwide network of charging stations. And now, things might get more futuristic than ever – with their (slightly weird) prototype design of a robotic charging tentacle. Built upon the notion of an automated charging mechanism, the ‘snake’ robot is envisaged as a device that can entirely achieve the charging action on its own. This automated scope includes determining the exact position of the car (and its charge port), and then connecting to this port by inserting the cable. Now, the ambit of automation in a charging station is obviously not a new one. But the predicament of most of these conceptions relates to practicality. For example, it is not always possible for the driver to park the car in the exact same docking ‘hot-spot’ where electric charging is imparted via some interface. 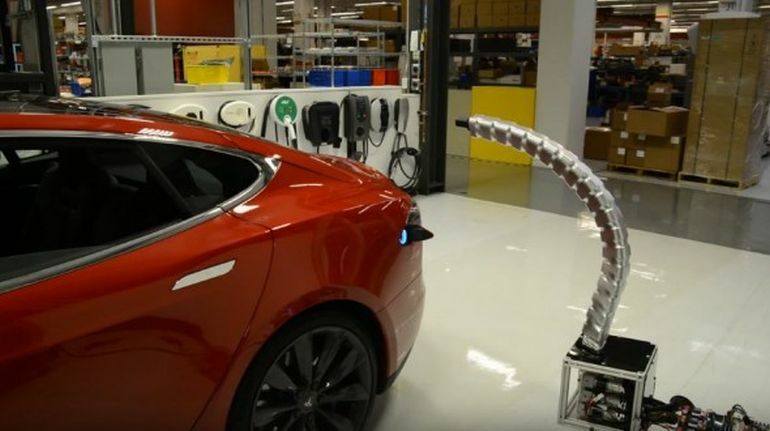 Tesla’s ‘snake’ charging robot seemingly traverses this problem with its flexible tentacle-like form. Basically, it makes the charger dynamic in nature – which allows it to move to the vehicle, as opposed to the vehicle moving to a pre-determined spot. Furthermore, this can also result in the same type of charger being made compatible to variant models of automobiles without the need for any system modification. But of course, as we mentioned earlier, Tesla’s ‘snake’ charging robot is still in its prototype stage, with further refinements expected to come in the future. However, once the technology is perfected, it can surely become a standard feature for many a EV charging station – thus totally eschewing the ‘hassle’ of human factor.